China faces a constant uphill battle ensuring its future ability to feed its population. To shed light on the country’s food strategies, we take a behind-the-scenes look at what’s changing in the agricultural sectors of China’s individual provinces. Gro Intelligence recently added data from China’s National Bureau of Statistics, giving Gro users a more comprehensive view of what’s happening in Chinese agriculture on a subnational level. China NBS data reveals province-by-province trends in area planted, yield, and production for a wide variety of crops dating back to 1949. As part of its strategy, China has made some sharp shifts in what grows where, which in turn affects yield and production. Large segments of agriculture, including rice, have moved farther away from urbanized provinces in the country’s Southeast and into less-developed regions in the Northeast, abutting Russia. A vast cotton-producing industry has grown in the far west province of Xinjiang. The province, with yields twice the national average, now supplies 80 percent of the country’s total cotton output. 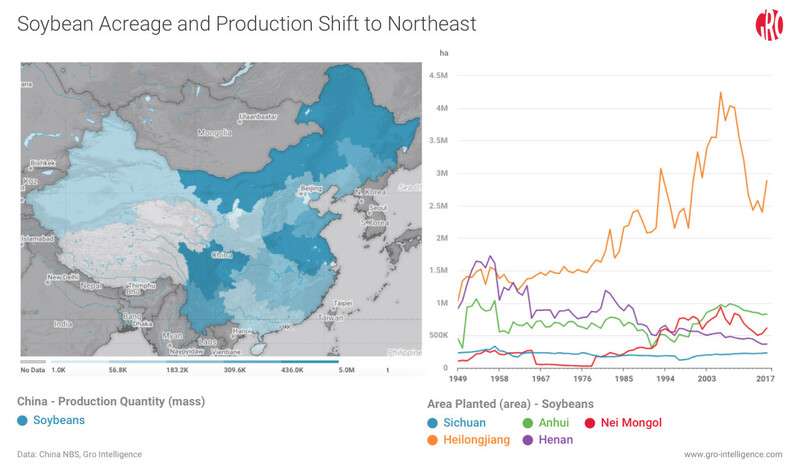 Soybean production has increased in many provinces, but none more so than in Heilongjiang and Inner Mongolia (also known as Nei Mongol) in the Northeast, where farmers receive subsidies to grow the important oilseed. 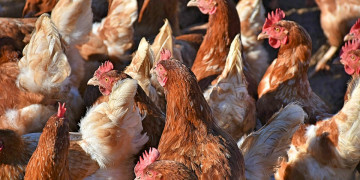 China currently must import 85 million to 95 million tonnes of soybeans a year, largely for animal feed for its growing livestock industries. In this Weekly Insight, we examine some intriguing agricultural trends using China NBS data that illustrate the shifting patterns in China’s food strategy. Gro users are invited to run their own analyses with NBS data, which covers a host of crops from peanuts and rapeseed to barley and mung beans, in addition to the biggest grains. If you haven’t yet signed up for a free Gro account, you can do so by clicking here. Heilongjiang province, in the far Northeast (see map, above left), produces more than a third of China’s soybeans. An emergency soybean expansion plan, especially in Heilongjiang, increased acreage available to soybeans and granted subsidies to encourage farmers to increase production of the oilseeds. China made agricultural news headlines for much of 2018 as it blocked most US soybean imports because of its trade war with the United States. Although China was able to bump up imports from South America, the ongoing trade dispute has highlighted its reliance on soybean imports and raised questions surrounding domestic production. Soybean production in China is concentrated primarily in Heilongjiang, the northernmost province that borders Russia to the east. In 2016, Heilongjiang produced 37 percent of China’s soybeans, or roughly 5.04 million tonnes. Yields, however, are low—less than half of what is reaped in the US state of Iowa. China’s other soybean-producing provinces display the same or even lower yields and make evident the fact that China will struggle to close its production deficit anytime soon. Still, the Chinese government is making strides toward boosting domestic soybean production. A substantial increase in subsidy payments to soybean farmers for the 2018/19 marketing year encouraged soybean plantings and a shift away from corn, which has fetched higher profits in recent years. 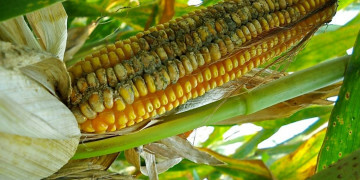 China’s Ministry of Agriculture and Rural Affairs took measures to cut corn acreage by 3.33 million hectares by 2020. An emergency soybean expansion plan was enacted in Heilongjiang last April, which included bringing 466,000 hectares of acreage into production. Other northern provinces followed suit by offering subsidies, and soybean production in 2018 reached 15.83 million tonnes, China’s highest figure since 2006. For 2019, the government has restored corn subsidies in Heilongjiang, but will still give greater payments to farmers planting soybeans. Chinese corn surprised markets in late 2018 when a decade of corn production and stock data was revised higher, much higher. The revisions, made by NBS, indicated that China produced 20 percent more corn than previously reported. The explanation given was that some farms in Northeast China were not previously registered with the government and therefore weren’t included in the initial corn estimates. Despite the additional supplies, however, corn prices in China remain high, and uncertainty surrounds the actual quantity of corn China has stocked. NBS data shows a huge surge in corn acreage in the northeastern provinces, including the upward revisions. Production increased a whopping 160 percent over the previous 15 years for Heilongjiang, Jilin, Liaoning, and Inner Mongolia combined. Yields in those provinces, while above China’s national average, haven’t improved dramatically, up only 25 percent since 2002. To put that in context, yields in US Corn Belt states improved 40 percent over the same period. Corn is grown widely (see map, above left) despite government efforts to draw down stocks and encourage other crops, especially soybeans. The chart at right shows combined production increases in four of China’s top corn-producing northeastern provinces. China’s Ministry of Agriculture recently announced plans to significantly increase production of potatoes, which provide more calories and nutrients per acre and use 30 percent less water than other Chinese staples like rice. China is facing a water crisis. Agricultural intensification and urbanization have polluted many of the country’s waterways with chemicals and toxic metals. Aquifers have been overdrawn for decades and now face depletion, making clean water a precious commodity. Rice production relies heavily on abundant, clean water, which is becoming increasingly scarce. Most rice, and the highest quality rice, is now produced in Heilongjiang in the Northeast, a shift that has occurred gradually since the mid-1980s and accelerated in the past decade. A new government policy issued in 2018 reduced minimum price support for rice growers by 10 percent, resulting in a decline in acreage planted of around 670,000 hectares, or roughly 2 percent. China’s Ministry of Agriculture announced plans to increase production of potatoes, which provide more calories and nutrients per acre and use less water than other Chinese staples like rice. 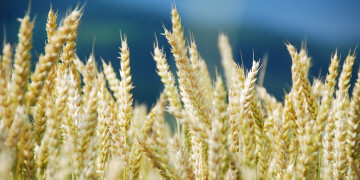 Minimum price supports for rice growers have also been reduced, resulting in a decline in acreage planted to the grain. 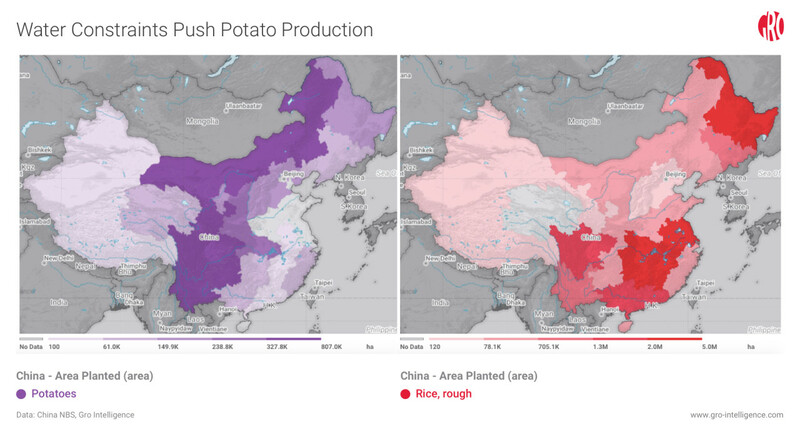 The maps above show the key regions of potato and rice plantings. Sichuan, a province in central China, is the country’s primary potato-producing state. While production there has doubled over the past decade, yields sit at nearly a third of what is routinely produced in the US. Poor quality seeds are primarily to blame, and Chinese scientists are working to develop seeds of higher quality to promote potato production nationwide. The rise in popularity of fast-food-style restaurants has whetted the appetite of Chinese consumers for products like french fries and highlights the growing demand for potato-based foods. Subsidies are an important tool of the Chinese government to spur agricultural changes. In 2015, the government instituted a “Target Price-Based Subsidy” for cotton production, but only for the province of Xinjiang (referenced as Xinjiang Uygur by NBS) in the far West. The subsidy guarantees a payment of the difference between the target cotton price set by the Chinese government and the global market price. The aim is to promote economic development in the more remote parts of western China as well as to increase availability of arable land in the South and East for more profitable crops. 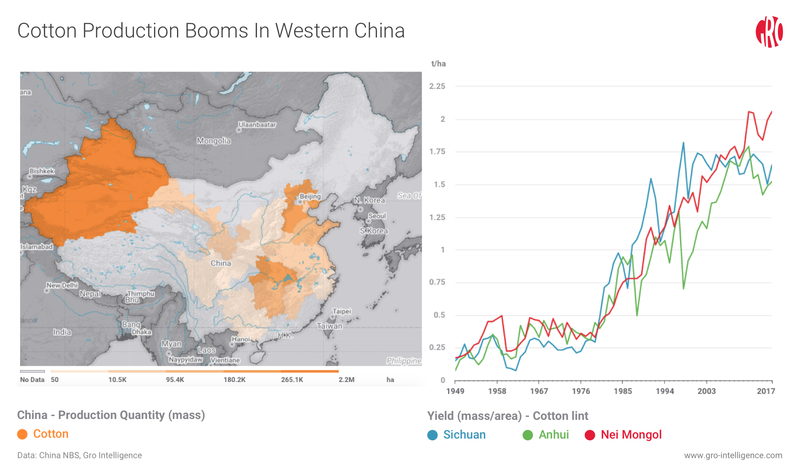 Soon after the policy was implemented, cotton acreage in Xinjiang exploded and cotton acreage in every other province plummeted. Xinjiang in 2017 produced some 80 percent of China’s total cotton output. Labor-intensive textile factories have also sprouted in Xinjiang, and Beijing aims to create 1 million textile jobs in the mostly rural province by 2023. Subsidies can become problematic, however. Last week the World Trade Organization issued a ruling faulting China for providing market-distorting subsidies for wheat and rice growers. In the past, these hefty subsidies encouraged Chinese farmers to plant more of those crops, creating an oversupply that cut into trade revenue for farmers in other countries. Some 80 percent of China’s cotton is grown in Xinjiang province in the far West (see map above, on left), spurred by government subsidies. Cotton yields in the province exceed those of other cotton-growing regions (chart, above right). China’s moves to shift crop production between regions can aid in ensuring long-term food security by overcoming challenges facing the country’s agricultural sector, such as water shortages and chemical pollution. Such efforts have the added benefit of helping to create more employment opportunities in rural areas. Subsidies have played a key role in implementing many of these changes, such as payments to farmers growing cotton in the far western province of Xinjiang, and to encourage soybean production in Heilongjiang in the Northeast. 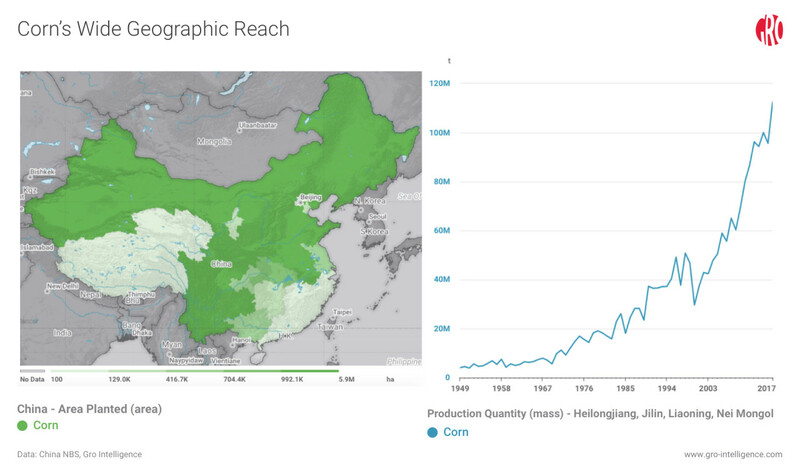 Data from China’s National Bureau of Statistics was recently added to the Gro Intelligence data platform, giving our users the ability to analyze Chinese agricultural trends on a subnational basis. 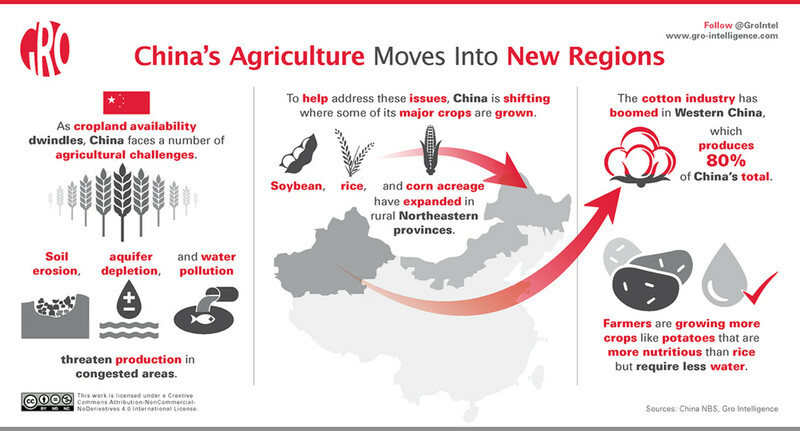 As China’s agricultural industry continues to evolve, having an in-depth view of what’s going on at the provincial level can provide valuable insights into those changes and their potential for success.